EVM and other materials, the materials were first retrieve from the water where the bus fall and accordingly informed to general observer. 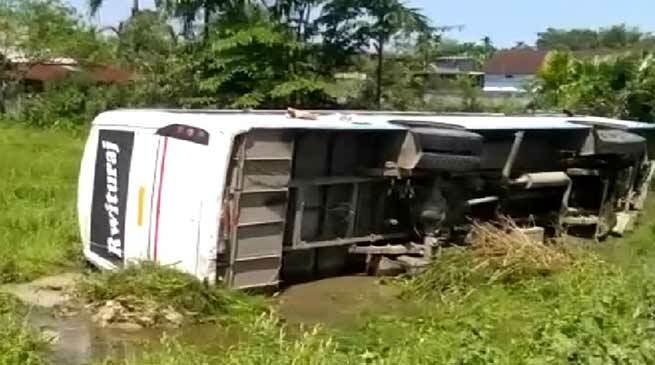 Namsai district Superintendent of Police, Ankit Kumar Singh inform that vehicle (bus) carrying poll personnel and polling materials of three polling station of Peyong circle of district meet with an accident in Namsai while on its way to district headquarter at around 1 AM on Friday. With regards to polling materials including the EVM and other materials, the materials were first retrieve from the water where the bus fall and accordingly informed to general observer stationed in the district with information to Election commission of India (ECI) and Nirvachan Bhawan, Itanagar respectively. However Additional Chief Election officer Kanki Darang said that since the information have already been given to ECI and it is upto the ECI to give necessary direction weather to conduct fresh election or not but we need to wait. He also further said that the engineer working for election purpose have also been informed and report awaited.